Last month’s foreclosure filings were down 20 percent from December 2010 with “foreclosure filing” defined to include any one of the following foreclosure-related events : (1) The serving of a default notice, (2) A scheduled home auction, or (3) A bank repossession. 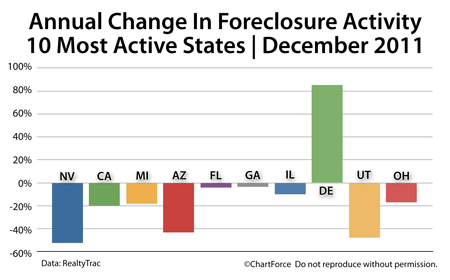 As a result of a unexpectedly strong year-end, 2011′s annual foreclosure rate was the lowest in 4 years. As a Canton home buyer — first-timer or investor — foreclosures can be a great way to find value. According to the National Association of REALTORS®, distressed homes typically sell at “deep discounts“ as compared to like, non-distressed homes. However, when you buy a foreclosure home from a bank, it’s different from buying a home from a “person”. Purchase contract negotiations are different and months may pass before your closing is approved.